Everyone is familiar with Facebook and many people have heard of Google+ so I’m not going to spend much time reviewing them, other than to say that for me, neither of them is currently a big part of my own professional presence. I use Google+ a lot but in a personal capacity not a professional one. Having said that, I’m exploring the potential of Google+ as a tool for professional development, and will probably post something about my experiences at some point in the future. In this section I’m going to briefly discuss a few social networks that are geared towards the academic professional, although not necessarily the clinician. If you are a clinician, you may still find these social services useful, but in my experience I’ve found that clinicians are more likely to share content on the more mainstream networks like Facebook and increasingly, on Twitter. First up is Mendeley, which is primarily a desktop (and iPad and smartphone) client that you can use to manage the research papers that you have in PDF format. It automatically extracts all of the metadata from the paper (i.e. author, title, journal, date of publication) and has some excellent search and sort features. However, one of the best features of Mendeley is its integration with the web, allowing you to sync all of your documents from any of your devices, to all of your other devices. If I highlight and add annotations to a PDF I’m working on at the office, when I get home and sync Mendeley on my home computer, all of those highlights and PDFs are updated to mirror that changes I made at work. If I add a PDF on my home computer, that PDF is then copied to all of my other devices as well. If you’ve ever been working at home and been irritated that the document you need is at work, or lost the flash drive you use to keep all your research papers, then Mendeley is definitely worth having a look at. Mendeley is also great for connecting you to other researchers in your field, via a web interface. You have to create a profile to use the software, and by completing the profile, you make yourself more visible to other people in your network of practice. There’s a Newsfeed that tells you when people you follow have made changes (e.g. uploaded and shared a new paper, made a comment, or joined a group). At the moment, a search on Mendeley for “clinical education” identifies about 80 people who are involved in clinical education research in some way, and almost 37 000 academic papers that include clinical education as keywords. There is an Advanced search feature that allows you to refine it your search to minute detail, including the specific domain of knowledge you’re looking for. Mendeley is one of the fastest-growing research databases, and with the social features that are built in, it’s also very engaging. In the screenshot below, you can see how it’s possible to access the metadata from all of your PDFs via the web interface. Mendeley is an excellent application and service that I use for organising the research content I already have, as well as for finding new content but in a narrow research field. It works really well for putting you in touch with other researchers who work in similar areas to you, and the Dashboard / Newsfeed view on the web makes it easy to keep up with those you’re following. In addition to desktop and web versions, Mendeley is available in a “Lite” version for the iPad (see below), and the open API makes it easy for developers to create 3rd party apps for Android, for example, Droideley. 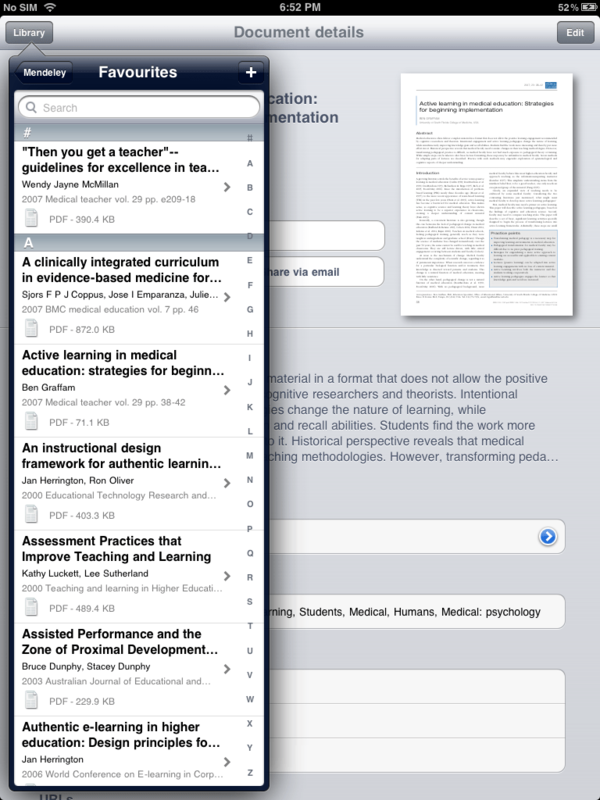 Mendeley running on the iPad, showing the “Favourites” view. Note: Zotero is another free alternative for gathering and curating your research content. I don’t use it much, mainly because it used to be solely integrated into Firefox, which is a good thing – if you use Firefox. Zotero has recently released a standalone client which is independent of the browser. In Part 4 of this series on the use of social media for professional development I’ll be presenting some of the features of ResearchGate, another social network geared towards academics. Here’s the abstract I submitted for SAAHE ’09. It was submitted for consideration in the Innovations and work in progress category. The use of blogging as a reflective tool in physiotherapy ethics. The use of social software in higher education facilitates collaborative learning practices and mirrors the social constructivist principles of education by encouraging deeper engagement with both content and individuals. Reflection promotes higher order cognitive skills that promote critical thinking, and together with ethical reasoning has been shown to contribute to professional development and clinical practice. A blog is a service that allows a user to post ideas online, as well as solicit feedback from others that serve to contribute to an ongoing discussion. This allows for a rich, diverse stream of ideas that provide further inputs into the reflective process. The main aim of this study is to evaluate the use of blogging as a tool for enhancing physiotherapy students’ reflective practice during an ethics module. By participating in an online, networked conversation on human rights in healthcare, students will discuss some of the problems inherent in the South African healthcare system, as well as recognise and acknowledge the different viewpoints of others. A blogging environment was created to allow only students and the lecturer access to post, read and comment on reflections. Articles relevant to the ethics module were provided for students to read and to inform their reflections. They are required to read and comment on the reflections of their peers, facilitating an ongoing conversation around the topic. On completion of the assignment, students will be asked to evaluate the process. With the move towards a more networked society and the increasing use of online tools in education and practice, educators must take cognizance of new approaches to teaching and learning. The use of blogging as a tool for reflective practice has shown positive results in other disciplines but has not been evaluated in physiotherapy education. The use of blogging as a tool for reflection brings significant advantages to the process that are not easily leveraged with any other medium. The characteristics of the platform allow for collaborative discussion, immediate feedback and encourages deeper engagement with the content, all of which facilitate more meaningful interactions and stimulate professional development.